I made my first-ever trip to Scotiabank Arena on Friday night, a building I’ve been to many times. I was hoping to see the Rock buck the trend and beat the Georgia Swarm, something they’ve only done once in nine (now ten) meetings – and never in Toronto. It almost happened, but at the last minute (literally, there was less than a minute left on the clock), Lyle Thompson decided to continue his amazing night by scoring one more. The Swarm hung on for the one-goal win in a close and entertaining game. Thompson was unbelievable all night. He scored four beautiful goals, though his second goal was particularly impressive, a sort of jumping reverse twister sort of thing that displayed not only his incredible skill but creativity as well. He actually did better when being defended: with defenders all around him, he found ways to get open and shoot but he was stopped on a penalty shot (though I wasn’t sure whether he was stopped by Nick Rose or by the post). Holden Cattoni had a good game for the Swarm as well, but Shayne Jackson and Miles Thompson were both held off the scoreboard almost entirely, with a single assist each. Rookie defenseman Adam Wiedemann was named third star of the game, picking up his first career goal (and three assists) in his second NLL game, and making an entire section stand and cheer (see the notes section below). On the Rock side, Rob Hellyer was outstanding, finishing with five goals and five assists. On this night, there were two Captains America, as Tom Schreiber (the usual holder of that title) scored two and added three assists, but fellow New Yorker Kieran McArdle scored two and had four assists. Schreiber continued to impress, not only in the offensive zone but he ran back on at least one Georgia transition chance and made a great defensive play to prevent a shot on an almost-breakaway. Hellyer tried to do the same when he got caught on defense but wasn’t able to stop Jordan MacIntosh on a transition chance. Don’t worry Rob, lots of players can’t stop Jordan MacIntosh on a transition chance. Within three minutes of that goal, Hellyer had scored two more and assisted on another so we’ll call it more than even. Brad Kri had another great game on defense and is becoming, in my mind, one of the top defenders in the league. Both goalies had their moments but I was a little concerned about Nick Rose. A number of times he’d make a save, the ball would drop down in front of him, and he’d wait a full second or two before making a move to pick it up, almost as if he didn’t see it. Once or twice I can understand but this was several times, and he was lucky that no Swarm player managed to pick it up before he did. The game was close throughout – the Swarm had a three-goal lead for about 30 seconds in the second quarter, but no other lead was more than two. The game was tied at 2, 5, 7, 8, 10, and 11. The Swarm held a two-goal lead at the half but then both defenses really cracked down. 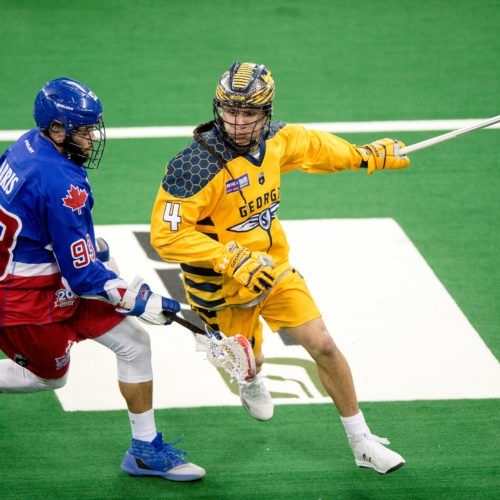 Four minutes into the third quarter, the Rock scored their first goal in almost thirteen minutes, then another seven minutes later, and then the Swarm scored their first in over fifteen minutes. In the fourth, the Rock scored three straight to take the lead with five minutes left (their first lead since halfway through the first quarter) but Lyle Thompson tied it up two minutes later, and then put the nail in the coffin with 24 seconds to go. In case you missed the joke in the first sentence of this article, the building formerly known as Air Canada Centre was renamed this past summer to Scotiabank Arena. I tweeted something about that name during the game and had to look at the scoreboard twice to make sure I got it right – is it Scotiabank Centre? Arena? Place? We’ll likely continue calling it the ACC for a number of years. I know people who still talk about SkyDome, which was renamed as Rogers Centre thirteen years ago. Former Rock captain alerts: We spotted Jim Veltman in the crowd, and Colin Doyle was there as well. Josh Sanderson and Brodie Merrill were both in Calgary with the Seals (Josh is an assistant coach and Brodie is now the Seals captain) and I have no idea about Chris Driscoll. There was a very large group of Georgia Swarm fans in attendance, many of whom seemed to be friends and family of Adam Wiedemann. His first-quarter goal brought the entire section to their feet, and I heard loud cheers for each of his assists as well. That group went nuts for Lyle Thompson’s game-winner as well, and I joked that there were more Swarm fans at the game in Toronto than at most games in Georgia. I was only mostly kidding. John Ranagan was given a five minute elbowing penalty. On the replay, it looked like a solid but legal hit, and then he brought his elbow up after the hit. Of course as Evan Schemenauer pointed out, the refs have to make the call in real time and don’t get the benefit of watching the play in slow motion. I can understand why it looked like an elbow to the head, which would have deserved five. Bummer for Ranagan but hey, the refs are only human. That’s sports.